Senior Dogs are a blessing; we can't say enough about why we love them! And because we love them we do all we can to reward them. To help them to age gracefully. We've provided some tips below to keep your senior dog happy and healthy. Always consult your veterinarian if you have concerns about the health of your dog and before making major food or lifestyle changes. Our senior friends are much too valuable not to. 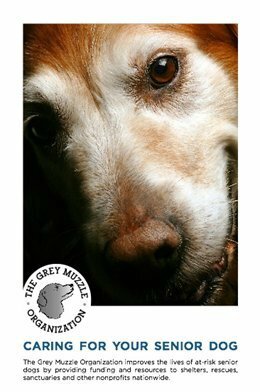 The Grey Muzzle Organization is an amazing charity and educational resource for all things Senior Dog. They work to help people provide the best possible care for their senior dog so guardians are better prepared to keep their aging companions in the home. They have created and published an article "Caring for Your Senior Dog" in collaboration with a leading veterinarian in geriatric medicine, a clinical nutritionist, and other experts in senior dog care. This article is full of practical advice and information, Caring for Your Senior Dog is a great guide for people who have an aging dog, and it includes plenty of tips for those who have just adopted an old dog (thank you!). This article is free; click the link below to view the article and save it in PDF format. Exercise plays a vital role in the daily care of your senior dog. As dogs age they naturally become less active and energetic, and there are lots of reasons for this. Weight gain, arthritis, anxiety, even failing eyesight can make a dog reluctant to get out and about in the way they used to. But a body that doesn't move isn't healthy, and immobility increases the risks of many conditions including heart problems, joint issues such as arthritis, obesity and more. Regular, gentle and appropriate daily exercise helps keep an older dogs joints, ligaments and muscles strong and supple, improves blood flow, reduces pain and/or inflammation, boosts mood and improves their overall quality of life. How to exercise your senior dog in a way that's safe and beneficial . Just like us humans, senior dogs begin to have health issues as they age. And, just like us, they tend to sleep more as they get older. That is a key reason why choosing the correct dog bed is as important as selecting a bed for yourself. Consider your dog's age and health. Good padding and support will give comfort to those old bones. As dogs age, they lose muscle mass, leaving exposed bony prominences. As a result, they will often get painful pressure points in the hips, shoulders, elbows, and knees. A good orthopedic dog bed will prevent these painful pressure points! '5 pound' memory foam is the highest quality-although more expensive, it gives the best support and lasts for years. '4 pound' memory foam which is what most 'humans' have on their beds. Lastly '3 pound' memory foam is the lowest quality-even known to lose its memory over time. Sadly, many orthopedic memory foam dog beds use the cheaper '3 pound' memory foam in their bed. Waterproof and resists moisture. Sadly many of our dogs become incontinent as they grow older. If you have invested in a memory foam bed, remember memory foam is still a foam, and like all foams, will absorb liquids, stains, and odours. The most frequent reason a foam bed must be discarded is it has soaked up urine and other liquid, and once that has happened, it begins to smell. Unfortunately, nothing can be done and the bed becomes unsanitary. Washability. Look for durable fabric that will last the test of time and washing. A senior dog bed should be easy to clean. The covers should be able to be removed for washing. Choose a style with a machine washable cover that can be easily removed for frequent washing. Extra long zippers are a nice touch since we all hate to struggle to get those covers on and off the dog bed! Easily a big pet peeve! Comfort. We want our dogs to be well supported and comfortable. Again, memory foam is a perfect material since it is shape and temperature sensitive. The foam molds to every nook and cranny of your dog's body, effectively eliminating all painful pressure points, protecting those bony prominences. Place your senior dog bed in a location that is free from drafts. You might want to purchase several senior dog beds and place them in draft-free locations near you their owners - living room, family room or bedroom. Our senior dogs want to be in the heart of the action and in the same room as their family. Choose sturdy materials that cannot be chewed or consumed by your pet. Make sure the bed is big enough for your dog. As our precious pups age its important to remember that they need as much love and affection as a dog at any age... that means your unwavering, without prejudice, undivided love. It's true that a senior dog may start to have accidents, their memory fade, or they may not want to chase the frisbee or go for long walks, but this is a normal sign of age. Our job as responsible owners, as decent human beings, is to continue to provide all the love and affection we can. Especially as our pets age their memory may also start to fade... please remember that they want nothing more than to please their people. Be patient and work with them. Some great ways of helping your pets brain stay sharp is to provide puzzle toys, play hide and seek, vary your walk routine, and engage with them in 'conversation' - talk to your pets. Age is just a number... but love, knows no limits.